Deliciousness or did you just barf in your mouth? 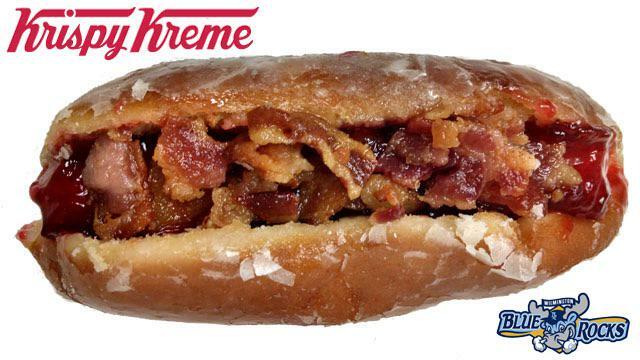 This bold flavored creation starts with a Krispy Kreme donut bun. The hot dog goes inside the bun, and is topped with bacon and raspberry jelly, giving you a combination of salty and sweet. If your mouth is salivating…in a good way that is…you’ll have to make your way to Wilmington, Delaware, because this dog is exclusive to The Wilmington BlueRocks, a minor league baseball team. This entry was posted in Hot or Not and tagged Blue Rocks, Foodie, Hot Dog, Krispy Kreme Donut Dog, Minor League Baseball. Bookmark the permalink.